If you’re used to shopping for costume jewelry, you’ll find that choosing an engagement ring is much more complicated. You don’t just walk into a store, choose a design you like, plop down a credit card, and call it done-at least, not if you want to be sure you’re getting a good price on the ring. Diamond prices vary hugely by the color and clarity of the diamond. You don’t need the absolute top-of-the-line diamond unless you’re a connoisseur, but you do need to understand what you’re paying for, and whether you’re getting a fair price. ◾The “whiter” the diamond, the more expensive it is. ◾The round cut you want is usually the least expensive cut. ◾The “sparklier” the diamond, the more expensive it is. ◾The larger the diamond, the more expensive it is. These are very general rules! Bear in mind that a large but cloudy and yellowish diamond will cost less than a smaller but very sparkly and white diamond. The typical engagement ring looks nice and sparkly, but it isn’t really a top-of-the-line diamond. You won’t find top-of-the-line diamonds in commercial jewelry stores-or really, anywhere other than at a jewelry wholesaler. And as you noticed, the price tag for the “very best possible” is quite high. You probably want a diamond that looks good in the ring and is fairly priced for its size and quality. If you’re an inexperienced diamond buyer, a commercial jewelry store is the easiest route. There are jewelers in every mall! Flip back and forth among your local alternative and Top 40 radio stations for a day or two, and you’ll hear all of their commercials. This will tell you which ones emphasize low price, which ones emphasize service, and so on. Or you can just browse a large mall. Different jewelers may have virtually identical rings for widely different prices, so it does pay to shop around. The mark-up on diamonds can be quite significant, so it’s not impossible that a jeweler will run a 40% off sale. Jewelers also often offer helpful services. As well as resizing rings, many will give you free cleanings and will tighten the prongs holding the diamond in place. It is also possible to buy diamonds wholesale and arrange to have the stone put in a setting of your choice. There are “real” wholesalers in big cities (New York City’s Diamond District has huge numbers of them) and “virtual” wholesalers on the Web. The wholesale price of the diamond itself is considerably lower than you’ll pay at a jewelery store-figure 30% to 45% less than retail. However, you’ll still have to find a jeweler to design the setting! 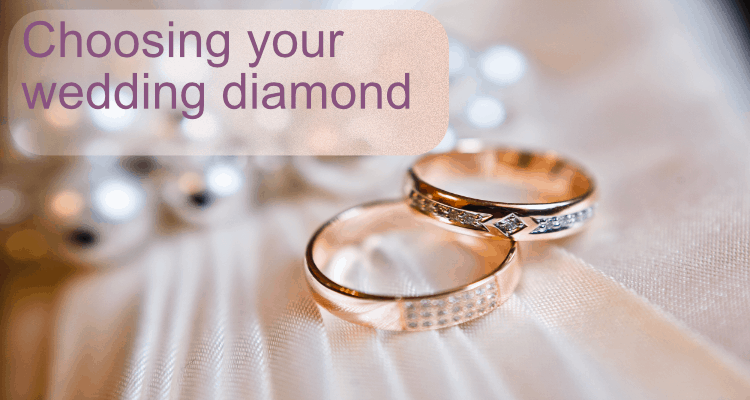 If you aren’t “into” finding the perfect diamond or designing the perfect ring, it will be much easier to just shop around at the local jewelry stores-unless you live near a diamond wholesale shop that’s open to the public. A few wholesalers sell actual rings, as well as loose diamonds, over the Web. I don’t feel comfortable recommending specific sites, as I’ve never dealt with any of them, but if you search on “diamond” and “wholesale,” you’ll get plenty of listings. Most sites have some sort of catalog or “diamond search” feature, but there’s not much uniformity from site to site as to how the search works. Do your research and shop around-but remember, you don’t have to be a diamond expert to get a nice engagement ring.